This is it people. In less than 24 hours (Less when you read this!! ), the FCC will vote on a proposal for net neutrality rules that will affect every single person reading this email. First, telecom lobbyists are pulling every string they have in Congress as we speak. It’s scary how powerful and organized they are. 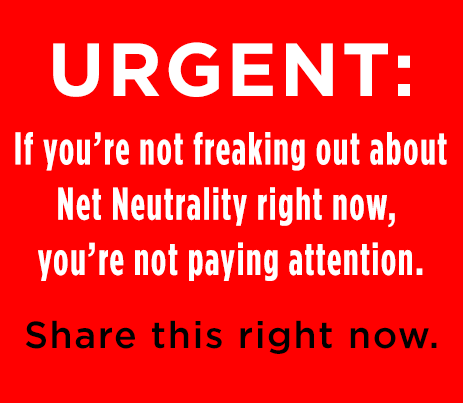 Everyone we know needs to tell Congress to not let the FCC sell out net neutrality right now. Second, join a rapid response gathering at FCC offices near you. MoveOn has events planned in over 20 U.S. cities! Click here to find one near you. Of course, the biggest and baddest protest is our Occupy the FCC encampment in Washington DC. It’s our last night sleeping there, and tomorrow we’ll join with tons of other groups for a Save the Internet rally in front of and inside the FCC, starting at 9am. Near DC? Come down when you get this. We’ll be there! Remember, the FCC is voting on this tomorrow so we need everyone to take action right now. We are winning but we can’t let up! P.S. At around 10 AM this morning FCC Chairman Tom Wheeler came out of his castle to meet with Occupy the FCC demonstrators who have been camped out on the agency’s doorstep for an entire week. He’s now (finally) willing to debate about reclassifying Internet providers as common carriers, which is the only step that can stop ISP’s from slowing down our favorite sites. P.P.S. Our tiny team has been literally working around the clock on this for the past week and we are thrilled with the results. Nearly every major media outlet showed up at the encampment today. If you want to help us keep winning, please donate as generously as you can today.